Qoppa’s PDF Swing components jPDFViewer, jPDFNotes and jPDFEditor have a side tab / pane that will show all file attachments that were added to a PDF document. 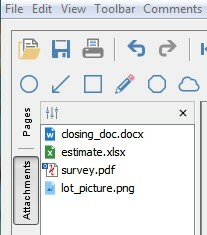 This is the attachment pane showing all the document attached to the PDF. It is possible to customize the handling of file attachments using the IWindowHandler interface. Here are the functions supported in the right-click menu of file attachments depending on the Qoppa’s PDF component used. jPDFViewer lets users open file attachments. jPDFNotes lets users open, save, delete or add file attachments. jPDFEditor lets users open, save, delete or add file attachments. It is possible to customize what menu items are displayed in the context menu, see the contextmenu package. Qoppa’s PDF components can open PDF portfolio but they will just revert to display a simple PDF document with file attachments. The portfolio animation will not render. PDF Portfolios are a proprietary format that can only be created and viewed by Adobe products. A PDF Portfolio is a PDF document that uses Flash to display attached documents in an animated way. Flash is not a part of the PDF standards and so unless you are using Adobe reader or Acrobat and have flash installed you will be unable to view the PDF Portfolio.